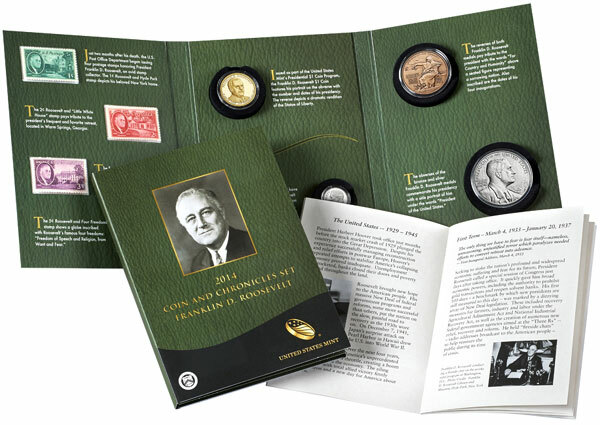 The United States Mint has started accepting orders for the 2014 Franklin D. Roosevelt Coin & Chronicles Set, which includes coins, medals, and stamps featuring the 32nd President of the United States of America. Four U.S. Postage stamps including the 1-cent Roosevelt stamp featuring “Hyde Park; the 2-cent Roosevelt stamp featuring “Little White House” paying tribute to the President’s favorite retreat in Warm Springs, Georgia; the 3-cent Roosevelt stamp “White House”; and the 5-cent Roosevelt stamp “Four Freedoms”. The coins, medals, stamps, and booklet are housed in a rich green folder covered in a soft touch material with a textured look. The sets are priced at $57.95 plus applicable shipping and handling. There is a product limit of 20,000 units and no household ordering limit imposed. 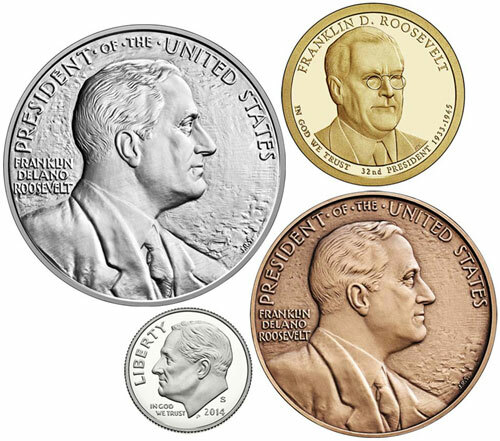 For additional information or to place an order, please visit the US Mint product page.